During my University years I worked at Harris Brush during the holidays, cleaning blades, injection moulding trays, riveting handles etc. Stoke Prior is a small village and has a close-knit community. Wilf Goddard used to work in the offices at Harris and after many years with them left to start up his own brush manufacturing company (BeeGee brushes), which is housed on a trading estate opposite Harris'. I have known the family since those first years. They are passionate and very knowledgeable craftsmen, and are the UK's only remaining pure bristle brush maker. Amongst other things, Bee Gee manufacture high quality brushes for specialist decorative finishes. In fact you will probably see a close / identical resemblance between their own brand brushes and what is available from some of the UK's most prestigious craftsmen brush suppliers! Bee Gee Brushes are the UK’s last remaining “Made in Britain” paintbrush company supplying bristle brushes for the DIY, trade and specialist decorating trade. Read Martin Guest’s overview of Bee Gee Brushes from the point of view of a TP decorator who has known the company almost man and boy. Bee Gee Brushes are taking this opportunity to talk direct to professional decorators and keen DIY about their company and the products they are really proud of. Please take advantage of this platform to interact with an innovative and industry-leading business. Ask Bee Gee Brushes questions about what you see and read here, and contribute any constructive comments about what they do well and what they could do better. Bee Gee Brushes is the last truly British bristle brush manufacturer. We’re a family run business, producing handmade bristle brushes in the UK since 1985 – we pride ourselves on each of our products; from our DIY range right through to our Handmade Decorative Effects brushes. Based in the Midlands, our primary function is the manufacture of top quality paint brushes. Although we specialise in decorator’s paint brushes we also manufacture DIY brushes for the domestic market and can offer an economy range to order. Originally supplying just 6 independent stores, we now supply to various wholesalers, small retailers and other major manufacturers. 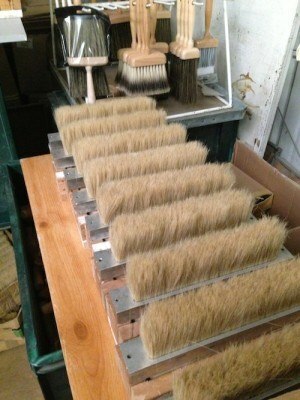 Alongside this, we also produce our own brand of brushes that we sell direct to the customer online. In fact, we are so passionate about our brushes that we even offer a custom made service; brushes to your specification – assuring total customer satisfaction. We supply custom made brushes with small minimum orders. For instance, if you want us to make your brushes with a particular bristle length, no problem. Or, if you need it to contain more or less bristle, we can do that… in fact, if you want your name printed on our rolled wooden beavertail handles, that’s possible too. Our custom made brushes really are bespoke to you… where else could you get this service!? Talk to us; we’ll make you a British bristle brush that is exactly right for you and how want to use it. When customers need a special brush for a specialised paint product, we are more than happy to help out, just send through your requirements and we’ll work with you to produce the bristle brush that best suits you and your needs. All of our special application brushes are made to our usual exacting Bee Gee Brushes standards, you won’t be disappointed. Bridled Glue Brushes, Budget DIY Brushes, Copper Bound Paint Brushes, Deluxe Paint Brushes, DIY Range, Laminating Brushes, Painters Dusters, Paper Hangers, Professional Paint Brushes, Sash Brushes, Stencil Brushes and Suds Brushes. 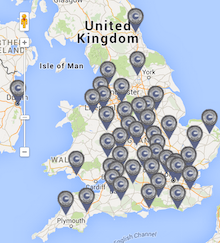 As you can see, we can make any sort of paint brush in any quantity really, right here in the UK. Please can you advise I am looking for the following sable or sable/mix – sword shape liner brush, do you manufacture? .Hi .I have several new pre-primed kitchen installs to hand paint & finish in Farrow & Ball Estate Eggshell [water based ] & would like your advice on the best brushes to acheive a flat finish with no brush marks & prices please .